So go make a magical tea infusion and get comfy and come dive into Madame Pamita's world for a little while! She has also given the New Age Hipster readers an incredible offer down below so be sure to read right to the end! I’m so excited about your upcoming book Madame Pamita’s Magical Tarot: Using the cards to make your dreams come true. How will this book help readers to develop their own tarot practice? I wrote the tarot book that I always wanted to see out there in the world - one that looked at new ways of using the cards beyond doing readings and new ways of looking at each of the cards as a portal to success and happiness. It's a great book for beginners to get a handle on the cards and also a great book for experienced readers to use to look at the cards in a new light. 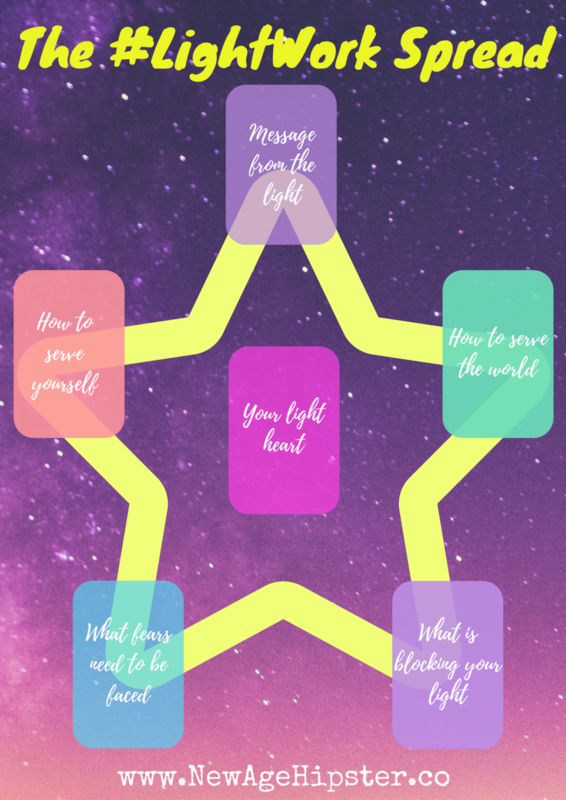 I give exercises for beginner readers to start to get to know the tarot, but there are a lot of in-depth tools, such as the affirmations for each card, that will bring a new viewpoint for even really experienced readers. My editor, the fabulous Judika Illes (who is an amazing author and very experienced tarot reader in her own right), said that I pointed out symbols on the Rider-Waite-Smith that she had never even seen before, so I think anyone who is interested in using the tarot proactively and looking at the cards as keys to solutions will get a lot out of it. How did you first discover and begin working with the tarot? I got my first deck when I was ten years old! I was in Salem, Massachusetts with my parents and we were in a witch-themed gift shop, probably Laurie Cabot's as this was back in the mid-seventies. My mom said that I could choose a souvenir and I chose a miniature Rider-Waite-Smith deck. I am sure that this is the very first tarot deck I had ever seen. I began playing with the cards as a child and as I got older, began reading books and studying with teachers and that's how it all began. What was it about the tarot that hooked you in? I can't remember a time in my life where I wasn't fascinated with divination, astrology, the occult. I was a little baby witch, for sure! But the tarot was for me, the ultimate goal. To learn to read the cards was always a huge goal for me when I was young. I really struggled with trying to memorize the cards and what they mean - the way I teach, I take out the memorization and show people how to learn to see and interpret symbols and connect them to their own intuition. That's the real way to read cards and that's why no computer tarot program will ever equal a skilled reader. Computers don't have a connection to intuition. They can only spit out rote interpretations of the cards, which isn't a reading at all. What were some of the other first decks you used? My first deck was that miniature Rider-Waite-Smith, my second deck was a full-sized Rider-Waite-Smith but my third deck was the Tarot of the Old Path, which is a fabulous deck with pagan imagery. It really opened up my eyes to other ways of understanding the symbols on the Rider-Waite-Smith. Comparing the imagery and symbols on more than one deck is a great exercise that can really deepen your understanding of the tarot. Well, my go-to deck is always the Rider-Waite-Smith. They are my old friends because the symbolism is so incredibly rich. It just continues to speak to me after more than 40 years of being around it. But, I do have other favorites - I love Ed Buryn's William Blake Tarot. William Blake is one of my spirit guides and this deck was gifted to me by a dear friend, so I have a beautiful connection to it. I also love any of the decks by Robert M. Place. I think he's a true genius and his decks are gorgeous. What are your thoughts on how predictive readings work? I believe in free will, so if one believes in free will, there is no such thing as a "destiny." However, that being said, I believe that we can see strong streams of energy moving in a certain direction and opportunities that are available to someone. I like to show my clients the map of where their opportunities lie (and the pitfalls to avoid), but it's up to them to walk the path. What is your favourite card to see in a reading? The Sun is one of my absolute favorites. It radiates the foundational feeling of pure joy and whether the querant's mind is on love, career, health or any other topic, it points to a good outcome. It's a card of carefree fun, positive recognition, everything being on the up and up. I think in my mind, I always want to be as open, joyful, and free as that naked little child enjoying a beautiful summer day! What is your least favourite card to see in a reading? It depends on the position in the layout. I mean, seeing a "negative" card in the past isn't a bad thing at all. It acknowledges that you've moved past that stuff, so it's sometimes a relief to see those kinds of cards in certain positions. But, if we're looking at "outcome" cards or cards that seem challenging on their own, one of the ones that I like to see least is the Devil. In my interpretation, the Devil can sometimes represent healthy rebellion or even fun rulebreaking, but more often than not, it represents power struggles. When it comes up in a reading, it often points to a struggle of some kind - maybe it's internal, maybe it's with another person, maybe it's with some institutional oppression. It doesn't necessarily mean suffering but it does mean you're going to have to pay attention, work through the struggle, and transform in some way. This transformation is often needed, but it requires some effort, that's for sure. It's the opposite of the carefree fun of the Sun. What is your go to tarot spread? I have a 7-card layout that I love to use and use often. It's one that I made up and I informally call it the Daisy Spread. I pull one central card and then pull six other cards and place them around the central card like the petals on a daisy. The central card gives me the big theme of the situation, the three above represent what's known and above board, the three below are what's happening behind the scenes. I look at the two on the left as what has been the foundation (known and unknown) and the two on the right as what is to come (known and unknown). The one at the bottom is the unknown thing that is "grounding" the situation and the one at the top is the highest outcome. The positions have multiple meanings and I love looking at the cards in multiple ways. As well as being a tarot reader, you are also a magical practitioner and work with hoodoo and rootwork practices. What drew you to that particular path? Magic and divination have always gone hand-in-hand for me. I began studying magic when I was a girl, really not long after I got my first tarot deck. I think that I have always had a natural talent for both. I definitely have always been attracted to both. When we are looking at a situation through a reading, we may see some areas that need some spiritual support and magic is that spiritual support. Maybe we are asking a question about career and we want to see more doors open or for the promotion or job to come faster. Spiritual work can help move those energies forward. So, I just see magic, and hoodoo as a branch of that magic, as an extension of a reading, the natural action that should follow a reading. Do you have any advice for readers who want to start their own spiritual business? First, get business cards made and second, carry your tarot deck with you and take every opportunity to do readings that you can and hand out those business cards. When I started to go public with my readings (after years of just reading for friends), I put myself in any situation I could to do readings for strangers. I read at friends' parties, I read at events, I set up shop in bookstores and restaurants (with the owners' blessing) - I just hustled, and as a result, I got to be a better reader and a better reader will gain loyal clients. Once that happens, everything else will fall into place. I have a store called Madame Pamita's Parlour of Wonders and people can find me online at parlourofwonders.com. From there, they can discover my services, the supplies that I sell, and also things like my YouTube channel and my podcast (look under "Instruction"). I also have a free ebook (and it's really a gorgeous one!) called "Seven Secrets to Supercharge Your Spellwork" and I give it away to anyone who signs up for my newsletter (which I send out about once a month). I would love to get to know your blog readers and for them to get to know me, so I want to give them a special discount of 25% off a Reading or a one-on-one Individual Instruction session - If they enter the promo code NEWAGEHIPSTER they can get 25% off a session (any length/kind). This offer is good for sessions booked anytime up to June 30, 2018. Yay! I just love those new moon vibes! And one of my fave ways to connect with the energy of the new moon is through a bit of card slinging! So light your candles, grab your decks (you can use tarot, oracle, New Age Hipster InstaOracle or whatever you have to hand!) and let's make some magic! Oh, and check out the New Moon Manifesting spread too if you like! This card will give you some insight into how to ground your energy, ground into who you are and what you really want. Basically, it's about getting yourself in the right space to make magic! Before you start calling in the new, it's always good to identify what old wood needs to be cut away, what space needs to be cleared and what no longer serves you. Making magic works best when we can feel confident and worthy! This card will give you some insight into how to stand in your power so you can make your magic powerful! Sometimes we already know exactly what we want to create and call in and just need a confirmation, sometimes we need a hand knowing where to direct our magic. If there's something you really want to call in, you can go through the deck and find a card that represents what you want to call in and place it in this position face up! Now that your magic is made, this card will give you some wisdom on how you can surrender and trust that your magic will be made in accordance with your best and highest good. If you dig this spread you might wanna check out my totally free e-book Tarot Spreads You can't Live Without! With love, light and new moon blessings!